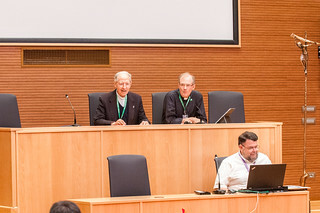 GC 36 Opening session with a Prayer. 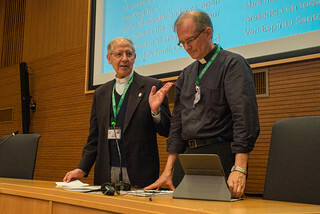 Adolfo Nicolás, hands over the meeting to Jim Grummer, SJ, as vicar of GC36. Afterwards, Adolfo takes his seat in among the delegates. 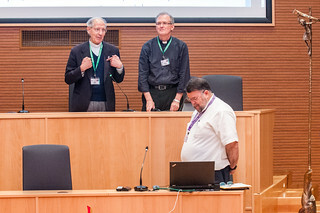 The members of General Congregation 36 had the opportunity to participate, during the preceding days, in information sessions about their work and technical environment in the aula, including the use of the electronic tablets through which they are getting access to the majority of the working documents and materials. Therefore, on this Monday morning, at 9:00 a.m., they were all set to begin the work of the Congregation in earnest. On the feast day of Saint Francis Borgia, patron of the General Curia, Fr. James E. Grummer invited the assembly to stand and invoke the Holy Spirit by singing the Veni Creator. Immediately after, he invited Father General to say a few words. Fr. Nicolás stated that he was handing over the facilitation of the Congregation to Fr. Grummer and that he had chosen him to be the Vicar General of the Society for the time before the election of a new General. Father Nicolás then opted to leave the rostrum and to sit among the other members of the Congregation. The assembly went on with the prayer. 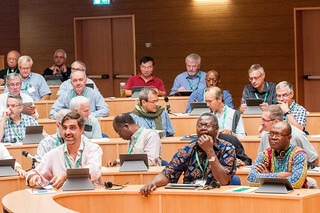 Every day, it is possible to pray along with the members of the Congregation since the prayer of the aula is available to all in the “prayer room” section of the website gc36.org. Father Grummer then introduced the team of copy secretaries who take notes of everything that is said during the Congregation. Then, each one of the simultaneous translators introduced himself specifying the languages he would handle. A word was said about the IT team. At that time, the assembly was ready to start its official business, the first step being to recognize that everyone was present and that the Congregation was “complete”. The media team of the Congregation left the room because all the Congregation work is done in camera. Later during the first morning, Father Nicolás submitted his resignation to the General Congregation. 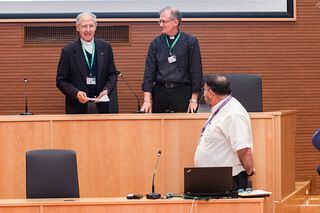 After deliberations, the Congregation voted to accept Father Adolfo Nicolás resignation as Superior General of the Society of Jesus. From that moment on, Fr. James Grummer took the responsibility of the Society of Jesus as Vicar General.